Surprise family and friends with our Happy Birthday cookie bouquet. Get the party started! 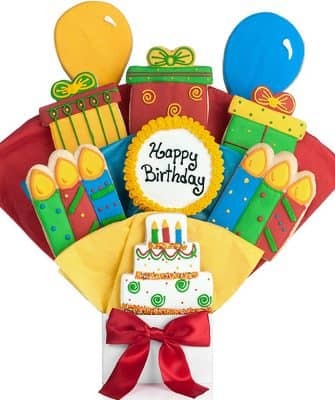 Let's think outside the cake box and enjoy our Happy Birthday cookie bouquet. There's enough excitement to go around. This popular assortment is a great gift for a Happy Birthday and features brilliantly hand decorated and hand iced Cakes, Balloons, Gifts and Birthday Candles. Who needs a cake when you can have it all in one?! A Cookie Plaque conveys the perfect message!